The Dilettante is having a not-so-dilatory week—busy doing things he doesn’t know how to do, like wire a barn, build a deck, and he is up against a paid writing deadline, so here’s a little eye candy so you won’t all forget me—six buildings that catch my fancy, for diverse reasons, in no particular order. The front door displays the chaste restraint that typifies the Federal style at its best. “Oak Knoll”, the Bertam Work residence in Mill Neck NY, designed by Delano & Aldrich in 1911. Work was the president of B.F. Goodrich. It is a superb example of a fully integrated classical scheme, with house and landscape conceived as one by the architects. Despite its classical and Roman antecedents, there is a hint of streamlined modernism to come in the 1911 design. The Garden House in the Grounds at Hamilton House in South Berwick, Maine, early 1900’s. It was built from the salvaged parts of an early 18th century house from Newmarket, New Hampshire, charmingly rearranged for romantic effect, in one of the loveliest gardens in one of the loveliest settings in New England. 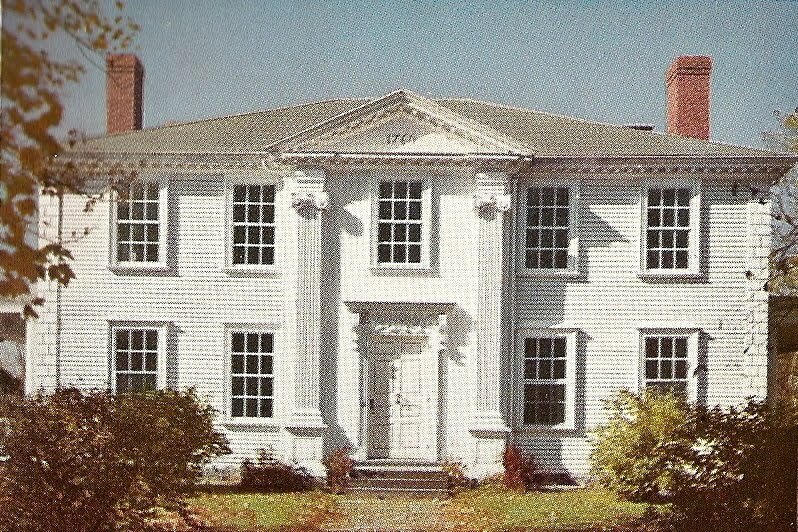 Upon seeing this early example of artistically arranged architectural salvage while visiting the owners of Hamilton House with his friend Isabella Stewart Gardiner,Henry Davis Sleeper was inspired to begin his ‘colonial’ remodeling of Beauport, his house at Gloucester, Massachusetts. Sarah Orne Jewett’s novel, The Tory Lover, is set at Hamilton House. 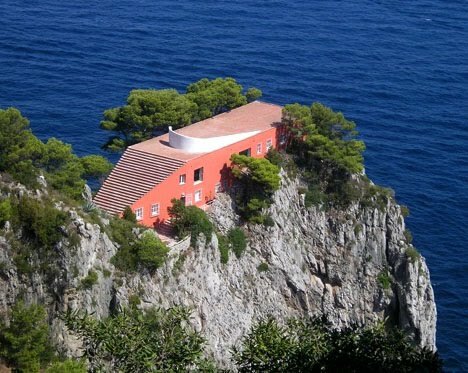 Casa Malaparte in Capri, designed by Adelberto Libera for writer Curzio Malaparte in 1937. It was a good year for modern houses on rocks on water—Fallingwater had just been completed, as had Fortune Rock on Mt. Desert Island. The Dilettante could be persuaded to overcome his severe discomfort around heights for this house. Jean-Luc Godard’s Contempt was filmed here in 1963, as seen in the clip from the film. 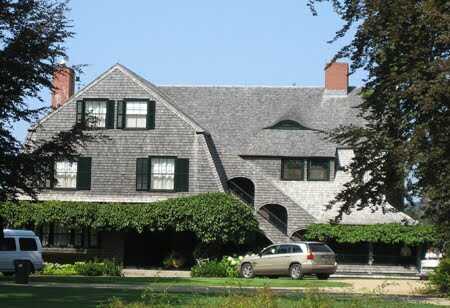 ‘Rosserne, a shingle-style summer cottage overlooking Somes Sound, Northeast Harbor, Maine, designed by Fred Savage in the late 1800’s. A perfect example, with a wonderful outside staircase. 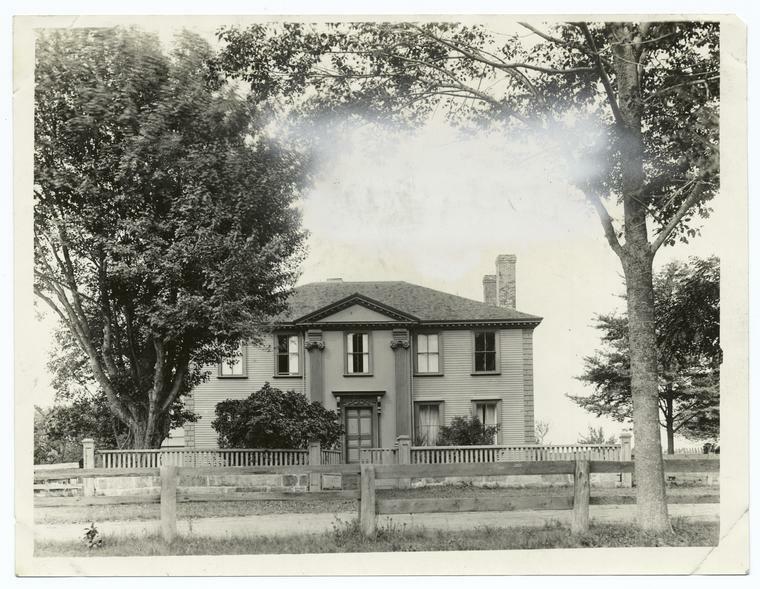 In yesterday’s post about Duck Creek, I mentioned that madness was setting in because I could not find my exterior photos of that lovely house, not yet digitized, lost somewhere in paper form somewhere amidst the cluttered file drawers. 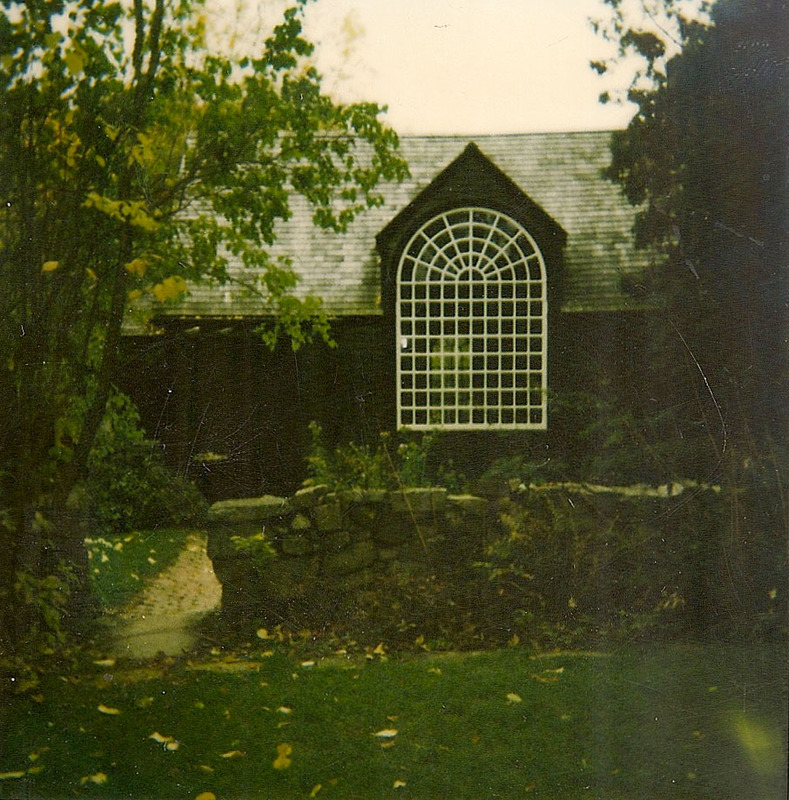 Architect James Shearron, of Bories & Shearron, designers of elegant small houses themselves, heard my cry of pain, and kindly sent along a wonderful group of pictures from his own files, thus saving my sanity for another round of blogging. The pictures were also a revelation, for as much as I have admired Duck Creek, over the years, I did not know that the house had originally been designed differently from its present center pavilion form. The earlier form, elegant in idea, somewhat betrayed its origins as a salvaged post office, on the entrance front. 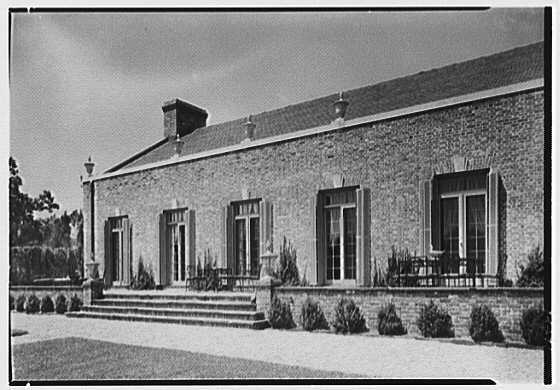 The garden front was long and restrained, elegantly punctuated by five French windows. Handsome urns were placed unusually and attractively on the parapet, above the windows themselves, rather than the more academic placing above the spaces between. Addition of a central flat roofed dormer gave the house more the air of a folly or garden pavilion. The three paterae above the central windows, a keystone above the central window only, and the brackets flanking and tying the dormer to the roof, are just the right amount of decoration in this perfectly scaled composition. 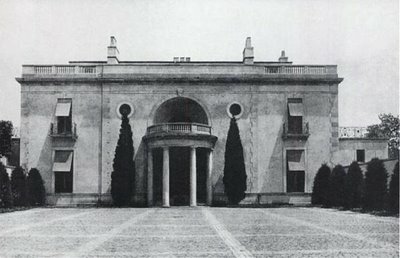 The entrance front as originally built. I’m afraid I must admit that in this view I have no trouble imagining cars parked diagonally in front as their owners pick up the mail. 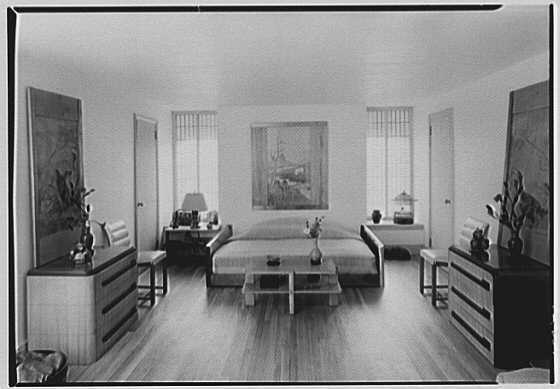 There was one more surprise in the photos that Mr. Shearron sent: Mr. Knudsen’s own bedroom, completely leaving the 18th century behind for a modernist style. 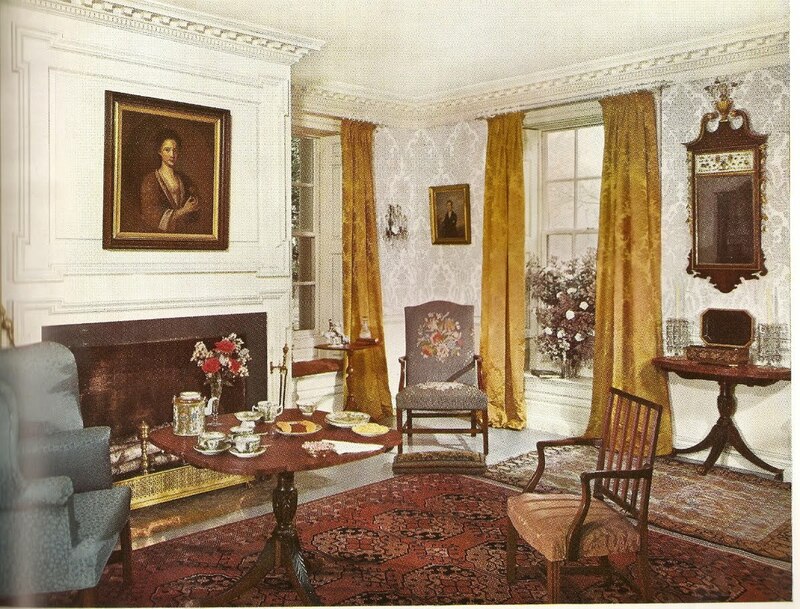 Interestingly, in this particular case, the furnishings appear more dated than the 18th century artifacts that furnish the rest of the rooms. I love many types of houses, from vernacular Maine farmhouses to graceful French chateaux to modernist glass boxes, but I have a special fondness for this type of house, relatively small, but designed with the the spacious intent of a larger house. 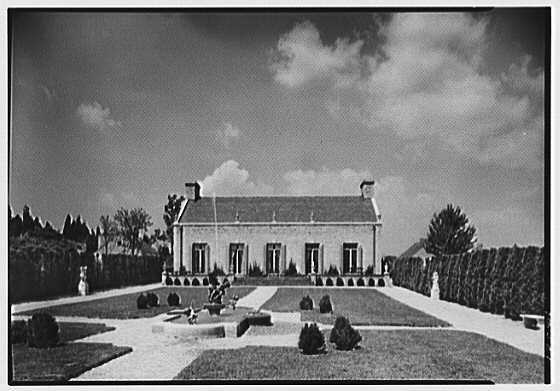 One sees it in all types of architecture—an elegant New England farmhouse, a story and a half high, yet with the Adamesque fan door of a mansion; a small French pavillion built around a central room with the airs of a large chateau; or Philip Johnson’s perfect, elegant Glass House. The would-be palace builders who cluttered up the landscape and suburbs over the last decade would have done well to heed the lessons of these small elegant mansions. Duck Creek is perhaps not a masterpiece, but it is masterful. 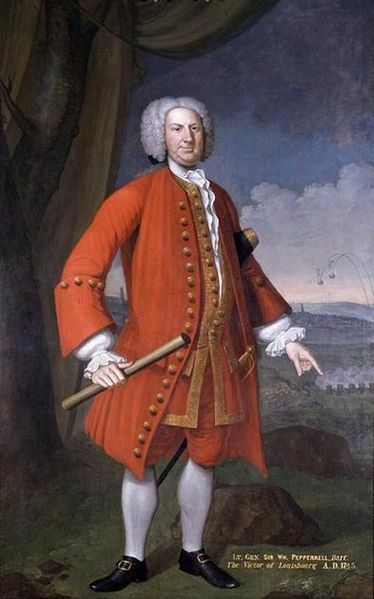 General Sir William Pepperell (1696-1759), the hero of Louisburg, was the first American born baronet, and the richest man in what was then the Province of Maine. 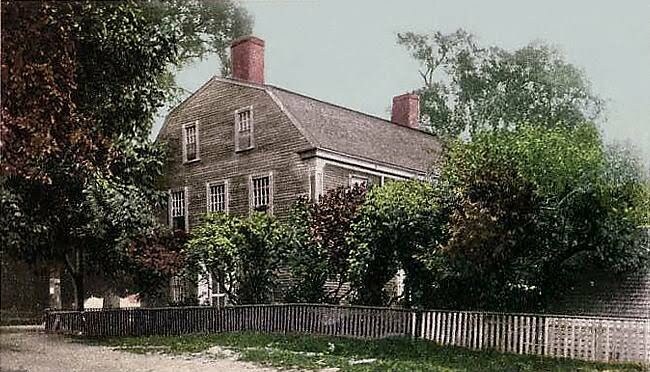 He lived comfortably but unpretentiously in his family’s commodious old house, built in 1682 near the shipyards and fish houses that helped fuel his fortune. 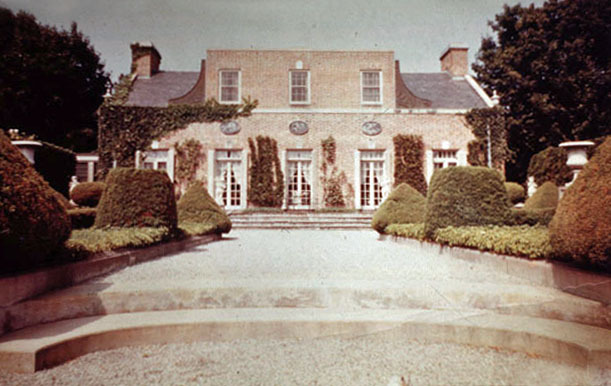 After his death, his widow, the former Mary Hirst, built a dower house a mile from the old mansion. 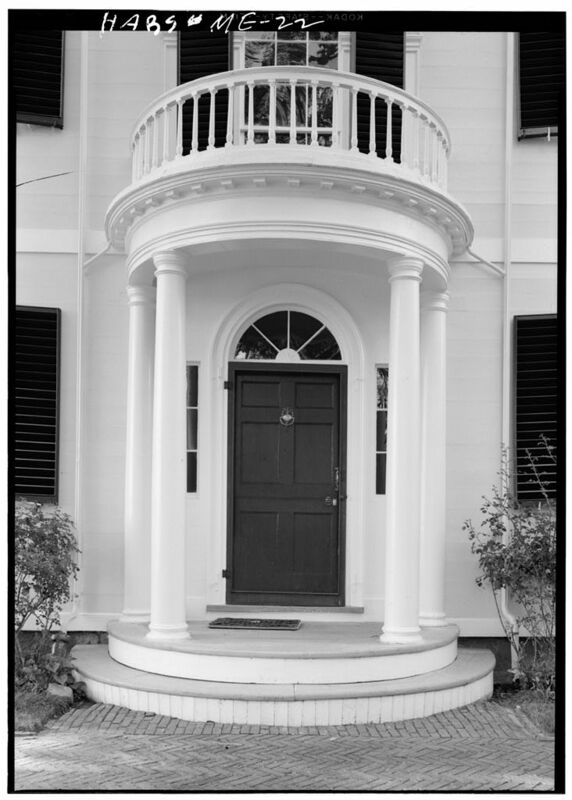 This small, forthright mansion with its bold ionic pilasters on under a central pediment, is one of the loveliest houses in Maine. The bracketed doorway features two intertwined dolphins. On this basis, the house has often been attributed to Peter Harrison, the English architect of King’s Chapel in Boston, and the Redwood Library in Newport, as have the Apthorp and Longfellow houses in Cambridge, which share similar compositions and details with the Pepperell House. 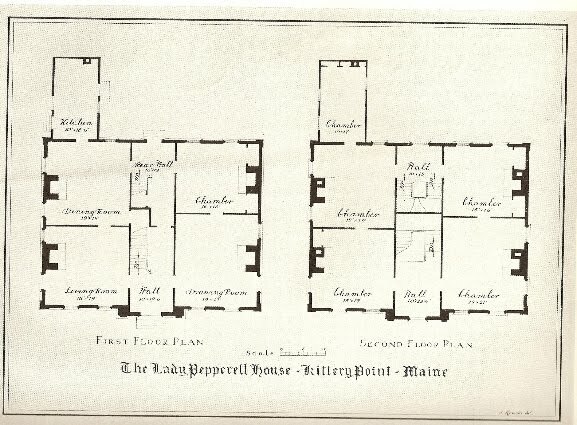 The floor plan is a classic simple 18th century plan, center hall, front and back stairs, 2 rooms on each side. The importance of the rooms is indicated by their relative size. The windows are large, and flood the house with light. While some could quibble with individual details of the design—-windows crowd the central pavilion, for example—the overall effect of the house, with its bold details casting high relief shadows, is stunning. Inside, the house features handsome simple rooms, beautiful cornices, deep windows with folding shutters and window seats. a staircase with twisted balusters, and simple paneled chimney breasts projecting into the rooms between windows to handsome effect. 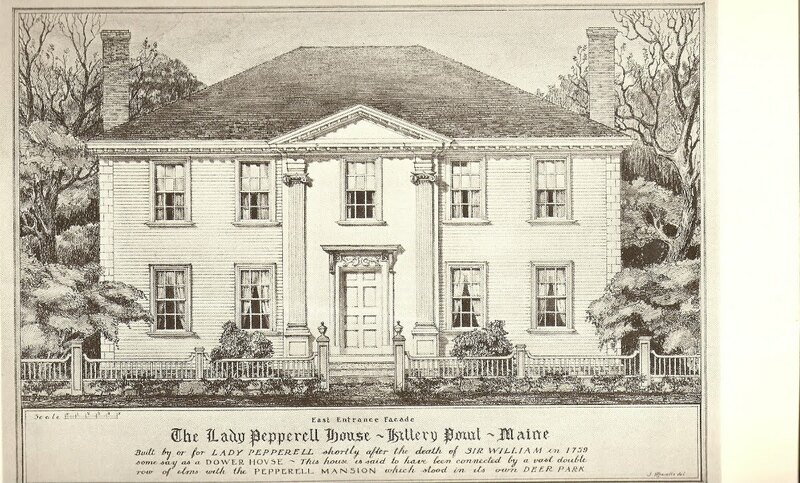 After Lady Pepperell’s death, the house went through various owners. 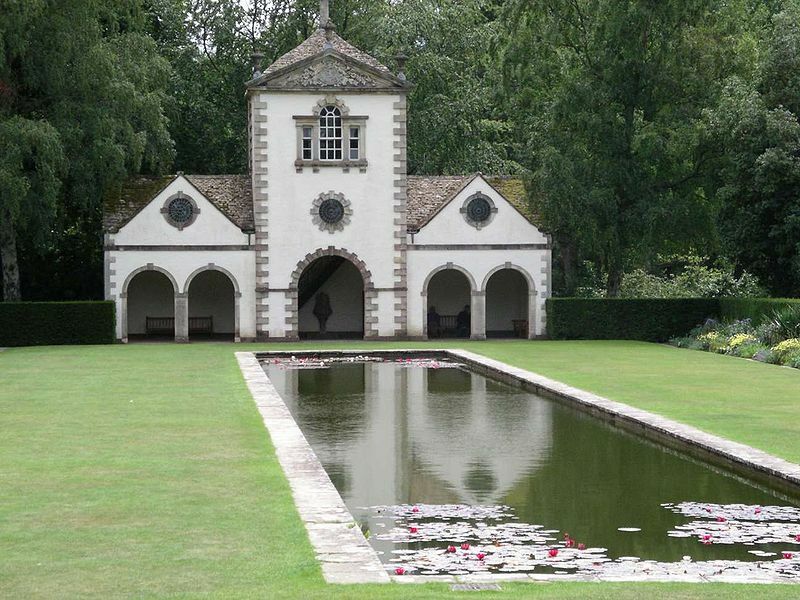 In the 1920’s, noted architect John Mead Howells*, son of William Dean Howells, who summered down the road, undertook a restoration for the new owners, who were to use it as a summer residence. 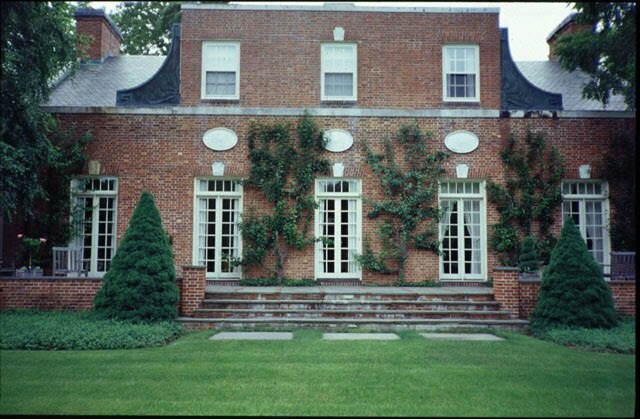 He added a matching pair of ionic porches to the sides, a bit fussy for the strong lines of the house. 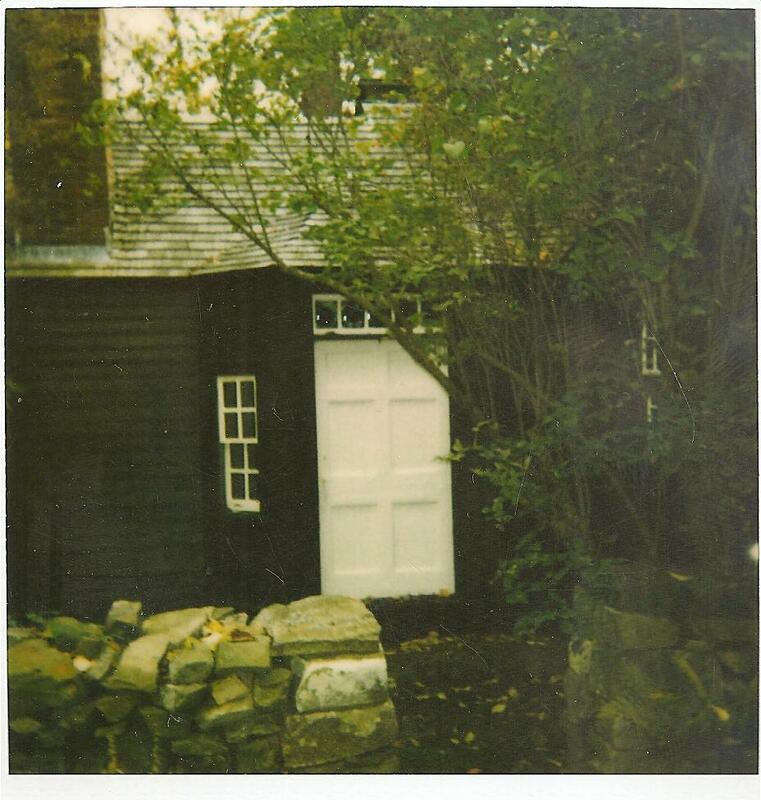 The house was left to the Society for The Preservation of New England Antiquities (SPNEA, now unfortunately renamed Historic New England in an attempt to be more relevant), who operated it as a house museum. Under visited, and it’s endowment fund too small, the house was sold to private buyers in the 1970’s, with substantial deed protections. A restoration of the interior was undertaken by the new owners, including reproduction of original wallpapers from surviving fragments. 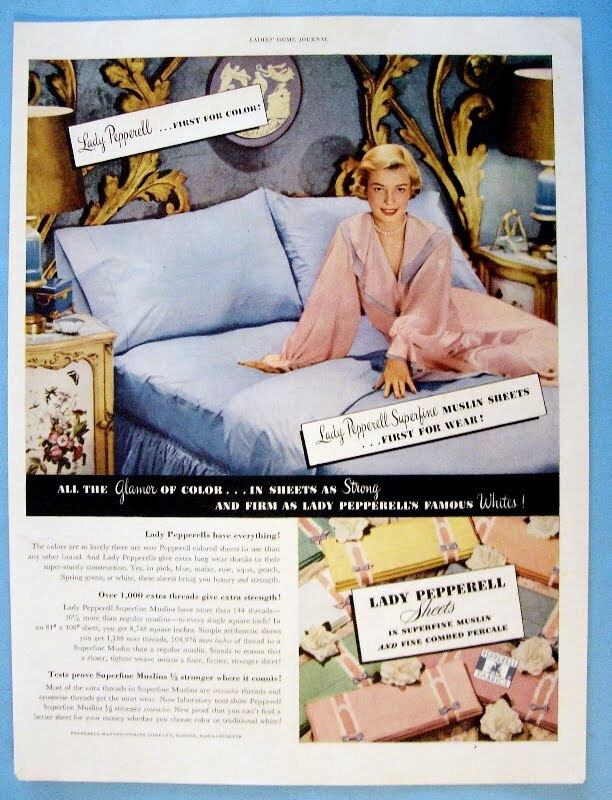 As for Lady Pepperell, her name lives on in a famous line of bed linens. *Interesting side note: Howells was a Beaux Arts trained architect. 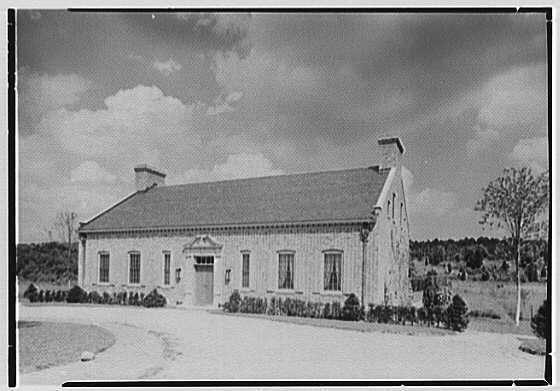 In the early 20th century, he was a major figure in the revival of interest in early American architecture, publishing several influential books, including The Architectural Heritage of the Piscataqua, and Lost Examples of Colonial Architecture . 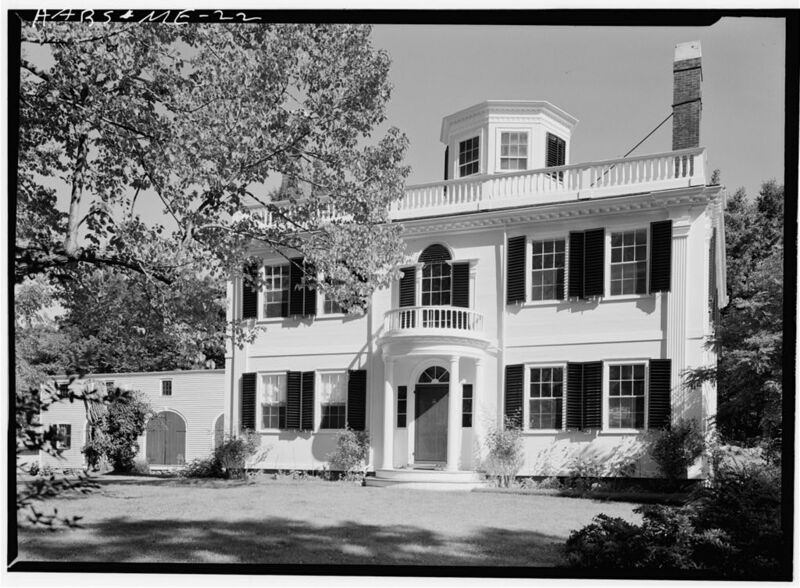 Howells must have felt some ambiguity about the porches he added to the Lady Pepperell House, as he included an early shot of the house in Lost Examples, with the caption noting that it showed the appearance of the house before porches were added. In his professional career, Howells worked not in the colonial styles he did so much to popularize, but instead was a major figure in the modernist skyscraper movement.